In part, it’s a fun surprise. Several Richard Armitage-related bloggers join forces for one week a year and have some fun! How is this different than every day? Well, I’m going to bump it up a notch. We’ll also be promoting each other more than ever. The fans are a big part of the focus in FanstRAvaganza! That’s you and me. 😀 Although it may have negative connotations to some, I embrace the word “fan” and use it in a light-hearted spirit. Since we are the fans, if you have any ideas on special events you would like to see shared on this blog, please post your suggestions in the comments box. I’ve said it before and I’ll say it again, this is a big team. We don’t live together, although it would be fun to take a group cruise altogether someday, LOL! Speaking of cruises, I’ll be departing on the 21st and returning on the 28th from my holiday. I won’t be on the internet that whole time. I wonder if there’s a withdrawal patch for that sort of thing? Big thanks to all of you who submitted your pattern pictures. The results will be posted tomorrow. See you then! 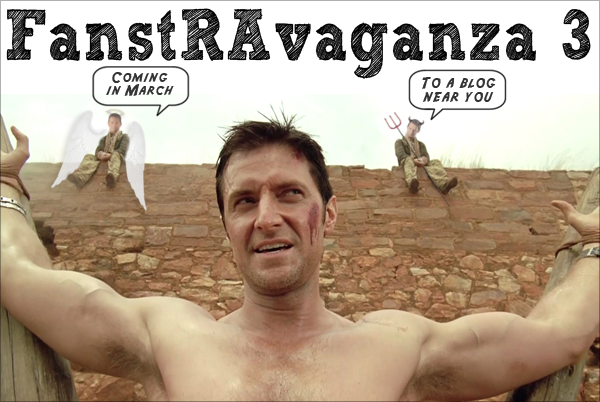 This entry was posted in FanstRAvaganza, richard armitage, Thoughts, Updates and tagged actor, chris ryan, chris ryan's strike back, fanstravaganza, john porter, richard armitage, richardarmitagenet, richardarmitagenet.com, richardarmitagenetdotcom, servetus, shirtless, strike back. Bookmark the permalink. 25 Responses to What is FanstRAvaganza? Hurray for FanstRAvaganza! Last year’s was when I first discovered most of the RA blogs. I just heard about this event for the first time in the last couple of days. It sounds like a lot of fun! Have a great time on your cruise. Be Safe! Enjoy cruisin’ and I hope in addition to fun and relaxation you can be inspired for more wondrous RA activities!! I heard about this event today and confess I’m very curious about it!!! By the way… I loved the little devil in the ‘picture’ above!! I also wish you have a great time in the cruise!! Have a great cruise, Bccmee! I hope it’s relaxing and fun. You deserve it! P.S. I’m also looking forward to FanstRAvanganza 3 since I’m a newby blogger. Can’t wait!!! I have been an RA fan for a few years now, but only discovered blogs last year, so this will be my first time to experience this phenomenon! I look forward to it and all its deliciousness! Whoal! i liked of the little devils and in special of that delicious man tied.The temperature rose in here.Lol! I´m also very curious about this FranstRAavaganza event.Oh, what a Big name! Bcc, I hope you enjoy a lot in this cruise. FanstRAvaganza sounds like a lot of fun! Have a great time on your cruise!!!! Lucky you!!!! Enjoy Bcc, as much as you can! It’s the first time I hear about “FanstRAvaganza” but it seem to great ! I am so looking forward to your FanstRA participation, but also your February challenge and all your creative ideas. Have a wonderful cruise and lots of fun !!! I totally forgot to tell you, I love your angel and devil and JP is just a perfect picture of indecision in the middle. Great !!! You’ve done yourself proud with all of the promo pics – they’re absolutely gorgeous. 🙂 Can’t wait for March! LOVE your Porter angel/devil and the Monet promos!!! So clever! Last year I heard about FanstRAvaganza but only at the tail end. I won’t miss it this year! Have a great cruise, Bccmee! Be safe! I look forward to this year’s FanstRAvaganza. There was really a lot of fun the last year. 🙂 And so far I remember the taste of chocolate coins. LOL! And the angel and devil barnner hmmm just love it! Have a wonderful cruise, and come back to us rested and inspired. Glad you like the angel/devil banner. *giggle* I’ve seen that picture of John Porter many times before but for some reason, when Lady Prisca submitted it for the patterns project, that crazy idea popped into my head. Yes, I had to slip in some Porter after all the Guyness, hehe. I’m really looking forward to FanstRAvaganza! Try typing that 3 times real fast! Welcome aboard everyone, both veterans and first-timers. We’re going to have a blast this year. There will be lots of new surprises and I can’t wait till we get started. In the meantime, we’ll have a February challenge to keep us occupied. See you when I return home! Can’t wait for FanstRAvaganza3! It will be my first even though I’ve been on the RA train a couple of years now! Enjoy your trip! I hope you enjoyed your cruise! I remember all the blogs of last years fanstRAvaganza. I remember I loved reading all the blogs and googling at all the graphics! So this year should be great too. I have an idea for you tho, which may be a little lame, but here goes…. why don’t you have one day dedicated to a character he has done (John on one day, then Guy, Lucas, Thorin…..etc) and do a video/flash graphic or wallpaper each day? It could be on a favourite quote of that character, or to emphasise a special moment of him. I hope you don’t mind I put John Porter a link on C-19 to your site on a thread promoting the FanstRAvanganza? I did the same last year, but didn’t use any of your graphics. I can’t wait to see this year – 34 Bloggers and 100 topics – wow, RA’s fan base has really grown! I wonder what’s in store for 2013 – you’ll have to rent a stadium in the clouds! @phoebe: I’m honored that you put a link on C19, thank you! 😀 I’m very excited about this year’s event, woohoo!